RS Components International is a distributor of electronics components and related products. They sell everything from resistors to microcontrollers, evaluation boards, Arduino boards and accessories, tools, and test equipment. From the main RS Components website, you can select the region that you are in to find your local RS Online shop. This is my experience of shopping online with RS Components South Africa. Electronic component supplier with online shopping. I have ordered electronics parts and boards from RS Components several times over the past few years and thought it a good time to write a review on my experience of shopping online with the company. 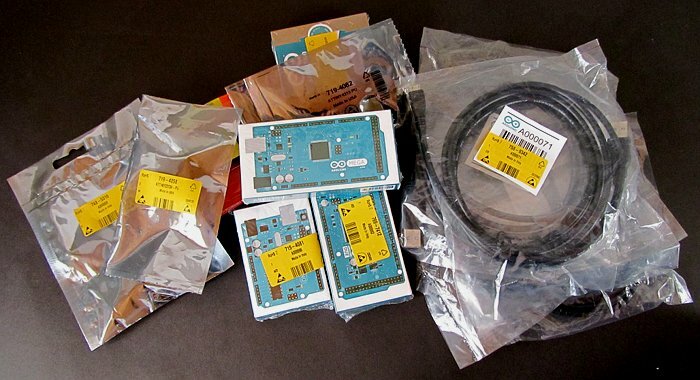 Arduino is extremely popular at the moment so my latest order included some Arduino boards so that I can extend the range of Arduino articles, tutorials and projects (such as the very popular Arduino Ethernet web server tutorial) on the Starting Electronics website. I also added some other components to the order – rechargeable batteries, microcontrollers, and other electronic parts. Registration on the RS website is necessary for online shopping, as would be expected. I registered with RS a few years ago, but remember the process as being straight-forward with no problems. Use the search box next to the "Find" button to find the part that you are looking for. The website can also be browsed by clicking one of the categories on the home page. After searching for a part, the search can be refined using parameters on the left of the page, such as number of contacts that the part has, brand, etc. and finally, "Price → Ascending" under "Sort by"
A search for this item currently shows only the expensive turned pin IC sockets. Searching for "IC socket" (without "DIP" in the search phrase) and then following the same refinement procedure shows the cheaper stamped contact IC socket for DIP ICs. The live help feature on the RS website allows you to communicate live with a salesperson by typing. A live help box will pop up on the site while you are browsing – this can be disabled in your account settings so that if you are browsing while logged in, the help box will not pop up. Items that you want to buy must be added to your shopping cart. The checkout procedure is smooth and allows you to review your shopping cart before making the purchase. Parts that are ordered before 16:00 are dispatched the same day for delivery the next day – this is for parts that are locally stocked by RS. Other parts that are not locally stocked may take a few days to deliver. With my order I received the locally stocked parts the next day with the remainder of parts scheduled for 4 days later (ordered on Monday before 16:00, received locally stocked parts Tuesday, remainder of parts scheduled for delivery on Friday). Delivery was free on my order even with the order being split into two parts. Email notification can be enabled so that you will receive emails on the delivery status of your order. Parts are well packaged and any static sensitive parts arrive in static shielding bags. Each item has an RS stock code sticker that allows you to find the part on the website easily later if you want to get an updated price or find the datasheet for the part. I have had a good experience ordering components from RS Components online and can recommend them. The delivery is fast, they let you know what is happening – which parts are in local stock, which parts will take longer and approximate delivery times. The only dislike that I have with the online shop is that sometimes a component will appear in the search that has an outrageously high price, maybe ten times the price that one would expect to pay. I have no idea why these items are listed at such high prices, so look out for this.